I’ve been neglecting my blog in favour of microblogging status updates and release notes, and have not written anything here for over a month and a half. Therefore I’m going to provide an overview of all the awesome (now also on StatusNet!) new things that have come out since then, along with other interesting news from the Semantic MediaWiki world. Yes, 1.5.4. Since my previous blog post, I have made 2 minor updates to the SMW 1.5.x branch: SMW 1.5.3 on November 4th and SMW 1.5.4 on December 1st. The focus of these releases is mainly on fixing bugs, increasing security and compatibility with MediaWiki 1.17. The only significant new feature are explicit strict and non-strict greater-then and less-then comparators, which Saruman paid me to add. The Semantic MediaWiki documentation wiki also got a facelift, including a new logo and redesigned Style. Most of the work here was done by Markus Krötzsch and Yaron Koren. See Yarons blog post for more info on the new look. After releasing Maps and Semantic Maps 0.7.1, I continued refining the new images-as-layers functionality that this release introduced. As I had accidentally broken compatibility with MediaWiki 1.15.x without noticing, I ended up doing a pretty quick 0.7.2 release, about a week later. In late November I got contracted to add KML export functionality to Semantic Maps, which I implemented in the form of a new ‘kml’ result format, and then released in version 0.7.3. Some additional options for the KML format are available when using the code which is on svn trunk, but that’s not enough of a change to justify a new release just yet. Several important releases of other SMW related extensions that are in the Semantic Bundle have also been made, most notable to Semantic Forms, which has progressed no less then 5 minor releases since my last post. Each of these was followed by a Semantic Bundle release, which also include updates to Semantic Internal Objects and ApprovedRevs. Several compatibility improvements have been made to Semantic Result Formats, but this extension hasn’t brought a new version yet. The last few days I’ve been working on an awesome new extension that’s meant to facilitate pushing page content from one wiki to one or more other wikis, called ‘Push’. It makes heavy use of the MediaWiki API, and takes advantage of the MW 1.17 Resource Loader when available (but is compatible with MW 1.16). You can use it on-page by clicking the ‘push’ tab, which will get you a list of targets to push to (specified in LocalSettings). It also supports bulk operations via Special:Push, which allows you to select pages in a similar fashion to Special:Export, and then, after submitting, pushes the pages one by one in a nice ajax-y way. I created this extension as WikiWorks consultant for Texas Instruments. 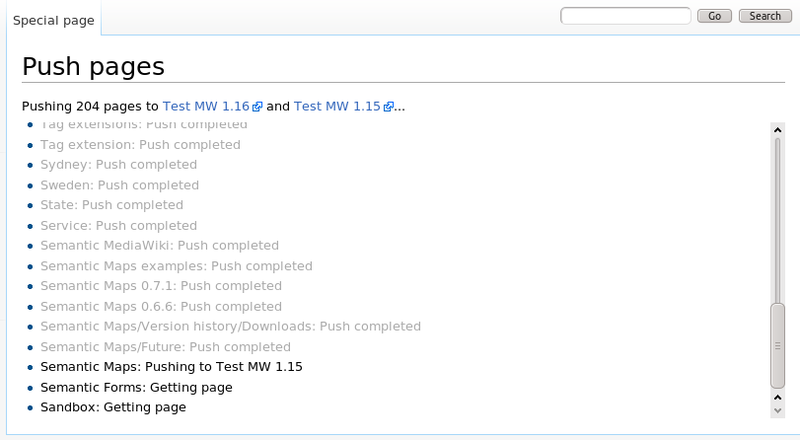 MediaWiki 1.17 has just branched, so hopefully it won’t take to long for it to get released. Awesome job! I particularly love the ‘push’ extension. This might be exactly what we need for our application! Please continue to rock the wiki world!